Granada is most famous for its historical monument the Alhambra, but if you dig beneath the surface you will find a hip, youthful city with a lot of culture and a great nightlife. Located near the Sierra Nevada, with the southernmost ski station in Europe, and only one hour’s drive from the beautiful Costa Tropical, Granada has plenty to offer its visitors. The city was founded in the 11th century, when Berber general Ziri ibn Manad took up residence in what was previously a small hamlet. 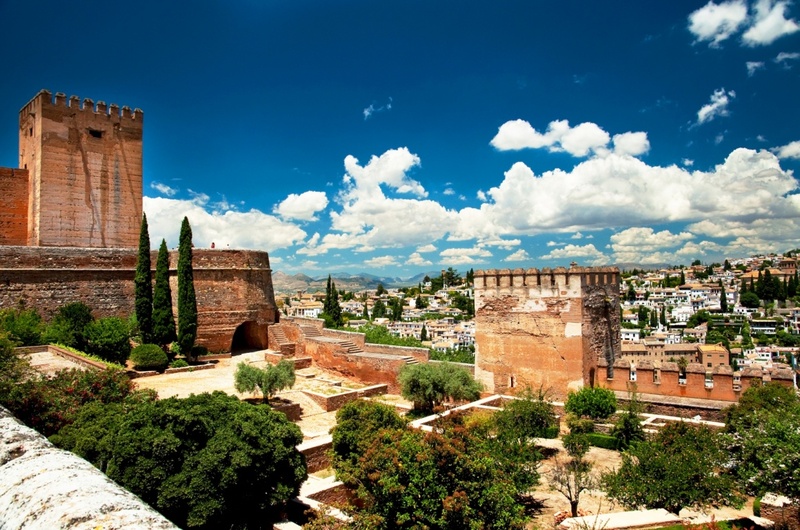 Granada quickly became one of the most important cities in Al-Andalus, and in 1333, the Sultan of Granada constructed the royal palace that was to become one of Spain’s main tourist attractions, the Alhambra. Alhambra’s lavish halls, courts and fountains are filled with Moorish art and decorations that has fascinated its visitors for centuries. Within the complex you will also find the beautiful gardens of Generalife and the much later palace of Charles V. Be sure to book your tickets in advance as the number of daily visitors is limited. Granada was conquered by the Christians in 1492 after ten years of war. The conquerors, Isabella I and Ferdinand II, now lay buried in the magnificent Royal Chapel built in Gothic and Renaissance style. The nearby Cathedral of Granada is the second largest cathedral in Spain, and is a spectacular example of a Renaissance building with Baroque elements. The Moorish heritage is still very much alive within Albayzín, an old medina where Moorish architecture blends with newer Andalusian influences. Included in UNESCO’s World Heritage list together with Alhambra and Generalife, Albayzín’s white-washed houses, Arabic shops and charming gardens will take you back to medieval times. Outside Granada you will find stunning landscapes, such as the private beaches and coves of Costa Tropical or the dramatic mountains of the Sierra Nevada. Mulhacén is, with its 3.481 meters the tallest peak on the Iberian peninsula, and the nearby ski station is the most southern in Europe. There are also plenty of hiking, climbing or canoeing opportunities in the area. Granada is a great place to try the delicious Andalusian cuisine with Arab influences, including local specialities like Olla de San Antón or Tortilla de Sacromonte. In many places you will receive a free tapas with every drink, so take the opportunity to find your own favourite among these traditional dishes. The best places to go to for a tapas is Albayzín, Campo del Príncipe, Realejo, Plaza de Toros and the city centre. The nightlife in Granada is lively and varied thanks to its large student population. The area around Plaza Nueva is especially busy in the summer months, and nearby nearby Paseo de los Tristes has plenty of bars and pubs. Students prefer the Pedro Antonio de Alarcon area, which offers both quiet pubs and lively discotheques. Find information about selected Hotels, apartments and rooms in Granada to choose the perfect place for your accommodation.